THIS NOTICE DESCRIBES HOW MEDICAL INFORMATION ABOUT YOU MIGHT BE USED AND DISCLOSED AND HOW YOU CAN GET ACCESS TO THIS INFORMATION. PLEASE REVIEW IT CAREFULLY. Basis for planning your care and treatment; Means of communication among the many health professionals who contribute to your care; Legal document describing the care you received; Means by which you or a third-party payor can verify that services billed were actually provided; A tool for educating health professionals; A source of data for medical research; A source of information for public health officials charged with improving the health of the nation; A source of data for planning and marketing; and A tool with which we can assess and continually work to improve the care we render and the outcomes we achieve. A Protected Health Information refers to information about you, including demographic information, that may identify you and that relates to your past, present or future physical or mental health or condition and related healthcare services. Inspect and copy your health record. In order to inspect or obtain a copy of your health record, you must submit a written request to Lisa Britt at the address shown above. The form for your request to inspect or copy your health record is available at our office. Additionally, you can contact our office at the telephone number listed above and request that a copy of the form be mailed to you. If you request a copy of the information, we may charge a fee as permitted by Louisiana law for the costs of copying, mailing or other supplies associated with your request. Your request to inspect and copy your health record can be denied by The Family Doctors in certain very limited circumstances. If you are denied access to medical information, you may request that the denial be reviewed. Amendment to your health record. If you feel that medical information maintained by The Family Doctors is incorrect or incomplete, you may ask The Family Doctors to amend the information. You have the right to request an amendment to your health record only during the time the information is kept by, or on behalf of, The Family Doctors. To request an amendment, your request must be made in writing and submitted to Lisa Britt at the address shown above. In addition, you must provide a reason that supports your request. The form for your request for an amendment to your health record is available at our office. Additionally, you can contact our office at the telephone number listed above and request that a copy of the form be mailed to you. Was not created by The Family Doctors; Was created by a person or entity who is no longer available to make the amendment; Is not part of the medical information kept by or for this office; Is not part of the information which you would be permitted to inspect and copy; or Is accurate and complete medical information. If your request for an amendment is denied, you have the right to file a statement of disagreement. 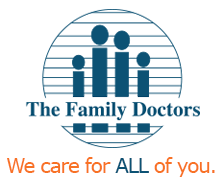 The Family Doctors also has the right to prepare a rebuttal to your statement of disagreement and will provide you with a copy of any rebuttal. Request restrictions. You have the right to request a restriction or limitation on the medical information we use or disclose about you for treatment, payment or healthcare operations. You also have the right to request a limit on the medical information we disclose about you to someone who is involved in your care or the payment for your care, like a family member or friend. For example, you could request that we not use or disclose information about a medical procedure that you had. We are not required to agree to your request. If we do agree, we will comply with your request unless the information is needed to provide you emergency treatment. To request restrictions, you must make your request in writing to The Family Doctors at the address listed above. In your request you must tell us (1) what information you want to limit; (2) whether you want to limit the use, disclosure or both; and (3) to whom you want the limits to apply, for example, disclosures to your child. The form for your request for a restriction/ limitation on medical information disclosed is available at our office. Additionally, you can contact our office at the telephone number listed above and request that a copy of the form be mailed to you. You may request additional restrictions on the use or disclosure of information for treatment, payment or healthcare operations. We are not required to agree to the requested restriction except in the limited situation in which you or someone on your behalf pays in full for an item or service, and you request that information concerning such item or service not be disclosed to a health insurer. A copy of this notice. You have the right to obtain a copy of this notice. You may obtain a paper copy of this notice by contacting Lisa Britt at the address listed above. Additionally, or printing this page from our website. Obtaining an accounting of disclosures of your health information. You have the right to obtain an accounting of disclosures of your health information other than for treatment, payment or healthcare operations. To exercise this right you must submit your request in writing to The Family Doctors at the address listed above. The form for your request for an accounting of disclosures is available at our office. Additionally, you can contact our office at the telephone number listed above and request that a copy of the form be mailed to you. Your request must state a time period that may not be longer than six years. The first list you request within a 12-month period will be free. For additional lists, we may charge you for the cost of providing the list. We will notify you of the cost involved and you may choose to withdraw or modify your request at that time before any costs are incurred. Request confidential communications. You have the right to request that we communicate with you about medical matters in a certain way or at a certain location. For example, you can ask we only contact you at work or by mail. We will accommodate all reasonable requests to the best of our ability. To request confidential communications, you must make your request in writing to The Family Doctors at the address shown above. We will not ask you for the reason for your request. Your request must specify how or where you wish to be contacted. We Will Use Your Health Information For Treatment. Your protected health information will be used and disclosed to coordinate your healthcare and any related services. For example, information obtained by a nurse or physician or other member of your healthcare team will be recorded in your record and used to determine the course of treatment. Your physician will document in your record the physicians expectations of the members of your healthcare team. Members of your healthcare team will then record the actions they took and their observations. This will allow the physician to determine how you are responding to the physician’s suggested treatment. We will also provide your physician, or a subsequent healthcare provider, with copies of various reports that should assist that individual or those individuals in treating you. We Will Use Your Health Information For Payment. Your protected health information must be used and disclosed in order to obtain payment for the medical services you receive. For example, a bill may be sent to you or a third-party payer for the medical services provided to you. The information on or accompanying the bill may include information that identifies you, as well as your diagnosis, procedures, and supplies used. In the event that payment is not made, we may also provide limited information to certain collection agencies, attorneys, credit reporting agencies and other organizations as necessary to collect for services rendered. We Will Use Your Health Information For Healthcare Operations. Your protected health information will be used to facilitate this medical practices operations and business activities. For example, a physician or an administrative representative with our office may use information in your health record to assess the care and outcomes in your case and others like it. This information will then be used in an effort to continually improve the quality and effectiveness of the healthcare and services we provide. Business Associates. There are some services provided to our practice through contracts with business associates. Examples of business associates include laboratory and pathology services, collection agencies, and a copying service used when making copies of your health record. When these services are contracted, we may disclose your health information to our business associates to enable them to perform their contracted services and to bill you or your third-party payer for services rendered. We require the business associates to appropriately safeguard your protected health information. Notification. We may use or disclose information to notify or assist in notifying a family member, personal representative, or another person responsible for your care of your location and general condition. Communication With Family. Unless you object, health professionals, using their best judgment, may disclose to a family member, other relative, close personal friend or any other person you identity, health information relevant to that person’s involvement in your care or payment related to your care. Research. We may disclose information to researchers when their research has been approved by the appropriate institutional review board that has reviewed the research protocol and established protocols to ensure the privacy of your health information. Health Oversight Activities. We may disclose your health information to health agencies during the course of audits, investigations, inspections, licensure and other proceedings. Health Oversight Agencies that seek this information include governmental agencies that oversee the healthcare system, government benefit and regulatory programs and civil rights laws. Deceased Person Information. We may disclosure your health information to coroners, medical examiners and funeral directors. Public Safety. We may disclose your health information to authorized federal officers in order to prevent or lessen a serious and imminent threat to the health or safety of particular person or the general public. National Security. We may disclose your health information for military, intelligence, counterintelligence, and other national security activities authorized by law. Organ Procurement Organizations. Consistent with applicable law, we may disclose health information to organ procurement organizations or other entities engaged in the procurement, banking or transplantation of organs for the purpose of tissue donation and transplant. Marketing. We may contact you to provide appointment reminders or information about treatment alternatives or other health-related benefits and services that may be of interest and benefit to you. Food And Drug Administration (FDA). We may disclose to the FDA health information relative to adverse events with respect to food, supplements, product and product defects, or post marketing surveillance information to enable product recalls, repairs or replacement. Workers’ Compensation. We may disclose health information to the extent authorized by, and to the extent necessary to comply with, laws relating to workers compensation or other similar programs established by law. Correctional Institution. Should you be an inmate of a correctional institution, we may disclose to the institution, or agents thereof, health information necessary for your health and the health and safety of other individuals. Law Enforcement. We may disclose certain health information for law enforcement purposes as required by law or in response to a valid subpoena. Change Of Ownership. In the event that this practice is sold or merged with another organization, your health information will become the property of the new owner. Other Disclosures. Federal law makes provisions for your health information to be released to an appropriate health oversight agency, public health authority or attorney, provided that a work force member or business associate believes in good faith that we have engaged in unlawful conduct or have otherwise violated professional or clinic standards and are potentially endangering one or more patients, workers or the public. Uses and disclosures not described in this Notice will be made only with your written authorization, including most uses or disclosures of psychotherapy notes; for most marketing purposes; or if we seek to sell you information. You may revoke your authorization by submitting a written notice to the Lisa Britt identified above. The revocation will not be effective to the extent we have already taken action in reliance on the authorization. Changes to this Notice. We reserve the right to change the terms of this Notice at anytime and to make the new Notice effective for all protected health information that we maintain. If we materially change our privacy practices we will post a copy of the current Notice in our reception area and on our website www.famdocs.com. You may obtain a copy of the operative Notice form from our receptionist or Lisa Britt. For More Information or to Report a Problem: If you have a question about our privacy policies or believe your privacy rights have been violated, you may contact Lisa Britt at 8383 Millicent Way, Shreveport, Louisiana 71105 (318) 797-6661. Additionally, you may file a complaint with the Secretary of Safety of Health and Human Services. There will be no retaliation against an individual for filing a complaint.